Hijacked accounts, promises of free iPads, IQ quizzes, and ring tones - these are all part of a massive spam attack hitting Facebook right now. I’ve received a Facebook private message that appeared to be from a friend inviting me to an event titled “Get @iPad_ for Free Event!!”. (See below). Other users have reported wall messages and status updates with phrases like “u have to check out this website its glitchin right now and sending out ipads to everyone for free!”. Similar spam messages have appeared on Twitter, via hacked accounts. A Facebook spokesman told IDG the iPad scam was affecting “an extremely small percentage of people on Facebook” but they took the threat seriously. 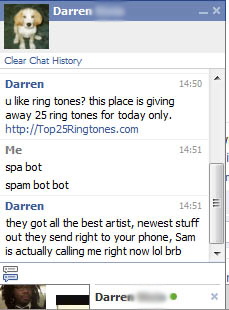 Meanwhile, Facebook users have also reported spammy chat messages touting IQ quizzes and mobile ring tones. The messages say "LOL is this you?" and are accompanied by a link that looks like it leads to a video on Facebook, one victim told CNET. In his case, clicking the link directed to a Web page with a "404-Page Not Found" error message and his account sent the spam out to at least one of his friends, he said. The spam was also reported on Twitter, but at this point the outbreak seems to be minor.